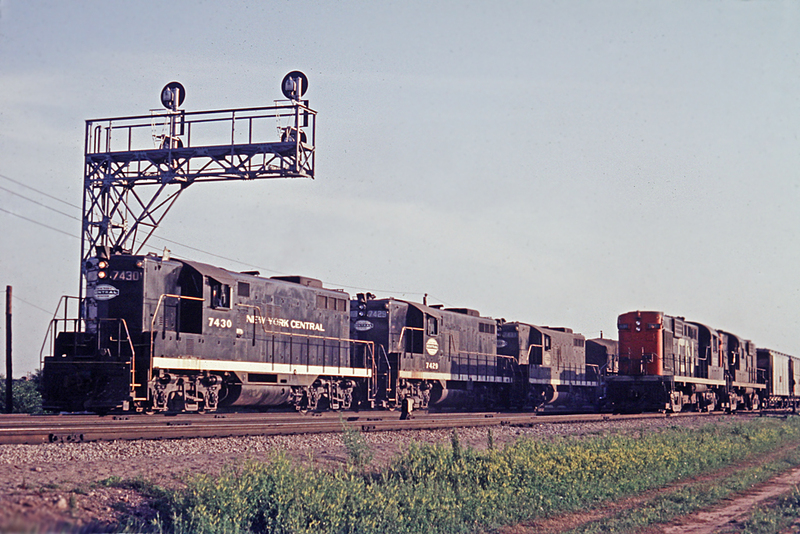 Railpictures.ca - Dave Burroughs Photo: Here are all three of the NYC 7400′s that normally haunted the Starlight or Kinnear. We have 7430-7429-7431 easbound at Aldershot East in the best order with 7430 leading with “New York Central” on the long hood. Meanwhile, a pair of CN MLW RS-18′s switch Aldershot Yard. | Railpictures.ca – Canadian Railway Photography – photographie ferroviaire Canadienne. Caption: Here are all three of the NYC 7400's that normally haunted the Starlight or Kinnear. We have 7430-7429-7431 easbound at Aldershot East in the best order with 7430 leading with "New York Central" on the long hood. Meanwhile, a pair of CN MLW RS-18's switch Aldershot Yard. Oh baby, this is nice.